Jim Jarmusch is a difficult director because he works from the frontiers. What does it mean to be a “frontier” director in the film world today? It means to work “on your own,” with all the difficulty and the consequences implied, on each film. It means to find the financing, international support, distribution, and opportunities that will somehow win some respect for your own project. But it also means an exhausting obligation to bring the project in line with varied and risky circumstances. Jarmusch is a frontier artist because he does not conform to aesthetic trends. He escapes them and reinvents himself, and succeeds each time in winning praise for his coherent depth, while innovating and taking great risks. He comes from the borderlands because he favors individuals who have been socially marginalized, people who are constrained to live in a society and in a period in which they feel very repressed. With great difficulty, they look for a way to survive, guarding even the smallest possibility of choosing their own destiny—or following their own path, in the event they have already figured it out. Jarmusch is from the frontier because he tells stories from the borders: between the center and the periphery (real and metaphorical) and between comedy and tragedy—or through adventures (westerns, thrillers, stories about voluntary outcasts), “pilgrims’ travels,” stories of initiation, comings-of-age that often lead to the abyss, not salvation. In short, Jarmusch is a director who is both ancient and very modern—postmodern only in terms of the free form of his stories. His roots are in eighteenth-century literature and its sprawling ramifications, which he confronts through the counterculture of the period in which he grew up. We observe the same humor in his films that one finds in Poe, Melville, and especially Hawthorne (and even the sardonic Bierce). We see the lessons of a recurrent typology born of metaphysical anxiety, of the continual, obsessive question about who we are and where we come from, who rules us and what purpose we should have or give ourselves to pursue. We observe, in short, the great, immense tradition of Puritanism, for good and for evil. We recall passages of F. O. Mathiessen, and Leslie Fiedler’s Love and Death in the American Novel, but also the cinema—indeed, behind the superficiality of so many movies there are sometimes similar, if not always conscious, roots. Finally, we think about how the Beat generation made an effort to demystify, and we think of their cinematographic equivalents—more New Yorkers than Californians. With respect to them and to the failure of their most ardent, most social, most utopian proposals for a new humanism, I believe Jarmusch succeeded in inventing “losers” as his most remarkable characters. He portrays those who are newly alone in confronting the task of living—not passively or without purpose—and the task of understanding and being. In his films, they may be inexperienced “pilgrims,” moved only by the unrequited and by a neurosis even they can’t name, or they may be aware “pilgrims,” perfectly conscious of the path on which they have set out. Jarmusch’s 1991 Night on Earth evinces all of these frontier qualities. A film about the unpredictable, it adopts a structure that was in vogue in the past: films comprised of episodes. There were masters of films like this: Julien Duvivier and all the directors of “the Italian comedy.” But they come from long ago. Decades later, Jarmusch had the idea of shooting stories with a set theme—the relationship between taxi driver and client—in the time span of a single night and in different cities around the world. “Roma” is the Italian episode and, of course, the one closest to home for me—with Roberto Benigni (the taxi driver) and Paolo Bonacelli (a prelate who is driven around without knowing he is dying, as if he is lost in a narcissistic delirium). It’s based on two ideas: a very good one, Benigni as an example of the excessive verbosity and growing stupidity of the Italian masses; and a more obvious one, Rome itself, which is to say, Catholicism and the Vatican. 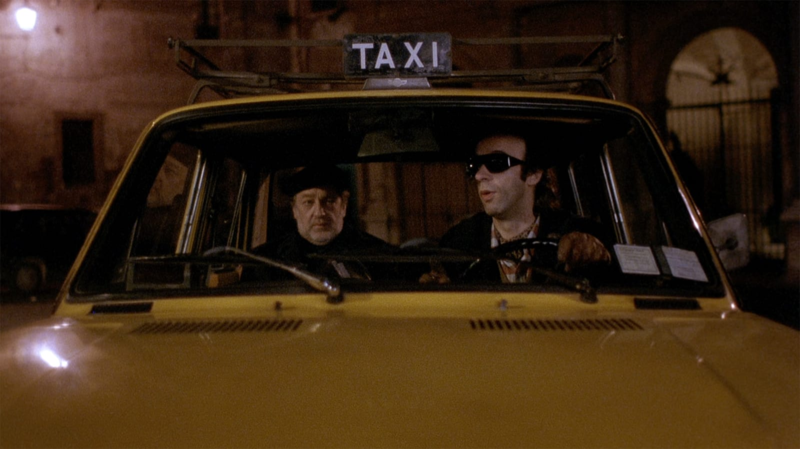 There are surely ample examples in Italian comedy of taxi drivers and priests being observed, and perhaps with greater verve than Jarmusch’s minimalism allows. (I’m thinking in particular of the episodes with Alberto Sordi in I nuovi mostri, which certainly wasn’t a great film but still succeeded in being nettlesome and provocative.) But that is not the point. Jarmusch is building a tapestry, and doing that starting from the idea that each city has its own rules, styles, people. And he certainly has found a true definition of the Roman night. One of the most appealing characteristics of Jarmusch’s work remains his penchant for the comic and comedy—the ground on which he was able to encounter a Benigni who hadn’t yet made money or betrayed his art and vocation. But we are well aware that behind Keaton’s struggle with a car in bad weather, and Chaplin’s battle with the masks of power, and the repeated, Sisyphean toil of Laurel and Hardy looms the metaphysical, and that evil and mystery are on the horizon. A night offers a vast gallery of possibilities for comedy and tragedy, for realism and dream states—and they are all fully here, in Rome and all of Jarmusch’s cities.